"We are investigating whether the attack was motivated by Islamophobia," Çolak told Anadolu Agency. "It is too early to make a comment on this at this moment, but if we come to such a conclusion, we will take the necessary steps," he added. President of the mosque, Mehdi Osmanlı, said several people were inside the mosque when the attack took place. He also said that police came to the scene of the attack after approximately an hour and launched an investigation into what happened and whether the attack was motivated by Islamophobia. The attack on the Turkish mosque took place at a time of rising concerns about the backlash of Islamophobia, a discussion currently at the forefront of American civil life. A little over a month ago, the New York-based organization called the American Freedom Defense Initiative (also known as Stop the Islamization of America) held an event awarding $10,000 to whoever could offer the best depiction of the Muslim Prophet Muhammad in Garland, Texas. Two gunmen opened fire on security guards outside the event the night it was held. The exhibition and subsequent shooting stirred widespread discussion of the effects of Islamophobia and its presence in the U.S. 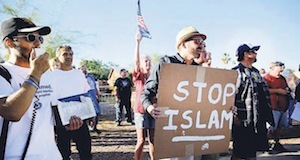 Hundreds of people gathered at the Islamic Community Center in Phoenix, Arizona to protest the shooting in Texas, with parties divided into protests of freedom of speech rights and protests against bigotry and to support the mosque. Earlier this month, Tahera Ahmad, a Muslim chaplain at Chicago's Northwestern University, accused a flight attendant on a United Airlines flight of religious discrimination in a post on her Facebook page that quickly went viral. A flight attendant refused to give her an unopened can of soft drink while the man sitting next to her was given an unopened can of beer. When asking why she wasn't given an unopened can, the flight attendant said the passenger might use it as a weapon, which a nearby passenger echoed with curse words. Apologizing for the flight attendant's behavior, United Airlines released a statement reading: "United does not tolerate behavior that is discriminatory – or that appears to be discriminatory – against our customers or employees." Shuttle America, owned by Republic Airways Holding and the operator of the flight, confirmed to the Guardian the flight attendant had been pulled from future United Express flying and would be retrained. Earlier this year, U.S. President Barack Obama, at his summit of countering violent extremism, sought to strike a balance between advocating for more acceptance of Muslim-Americans while also applying strong pressure against radicals who could turn violent. During his remarks, he said, "We are not at war with Islam. We are at war with those who perverted Islam." The mosque, built by Turkey's Presidency of Religious Affairs and the Council of Ahiska Turkish-American Associates, opened earlier this year in March.